Culture and entertainment in Turin can be found everywhere you look in this city. It goes beyond even the museums and royal palaces and can be found in their many forms of entertainment that you will find in abundance here. In those times that you wonder what to do in Turin, Italy you will find Turin cinemas, theaters and nightlife in Turin worth checking out. So you’ve come upon some bad weather and find yourself wondering what to do in Turin on a rainy day. Well, what would you do back home in this case? Go the movies! These three movie theaters are where you will find the latest movies in their original versions. (Hint: look for v.o. or o.v – Versione Originale or Original Version) Remember that original version doesn’t always mean English, but you will certainly find English movies here at some point. Now, if you are a real movie buff, then we highly suggest skipping the actual movies altogether and checking out the Turin Cinemas Museum for everything movie related. Another option for a rainy day/night is of course, the theater. Sit back and relax in one of Turin’s beautiful theaters. After surviving several different owners, a fire and plenty of renovations this theatre was finally complete in 2009 and is now considered one of Italy’s most advanced theaters. If you can think of a famous Italian actor, chances are they have performed here. One of the biggest and important theaters in Italy, focusing on opera, ballet and concerts. 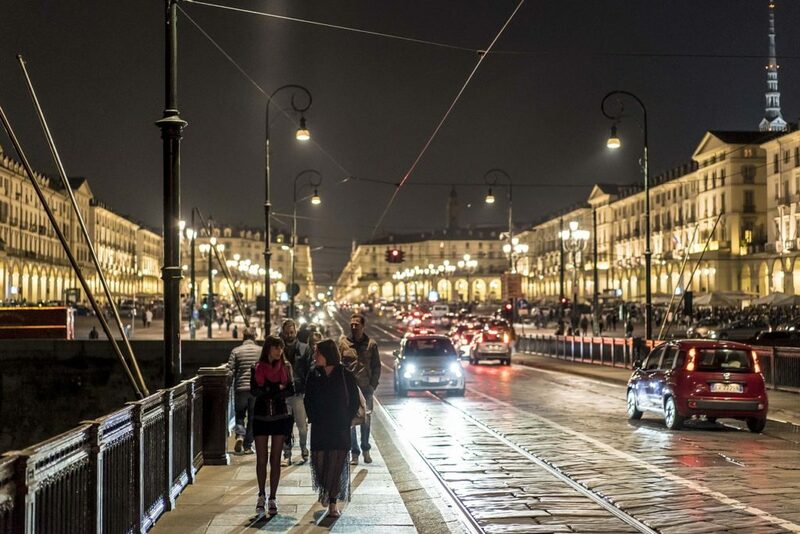 So, what to do in Turin at night after the movies and the theater? There is not the best nightlife in Turin when you compare it to the likes of Milan or Rome, however, don’t let that deter you, there are some great clubs in Turin worth drinking and dancing in. For a more in depth look at the Turin clubs and bars, check out our Turin Bars and Clubs page where you can read more about The Big Club and The Beach. If you are in search of a gay bar, check out Turin gay clubs for a list of clubs and nights dedicated to the LGBTQ community. For some quick tips, we think that the best area in Turin for nightlife during the summer is The Murazzi and Docks Dora where you will find a thriving nightlife along the River Po. Otherwise, in the colder months, If you are looking for a pub/wine bar vibe, check out the Quadrilatero Romano for some cool spots. Lastly, if it’s a good cocktail you are in search of, check out Via Santa Chiara and Piazza Filiberto for a nice lounge and cocktail bar selection. Lucky for you, there are many things to see indoors and nothing is too far that you can’t get there quickly by foot. Check out our Turin Culture page for suggestions on museums, monuments and exhibits. Also, remember, if you are into winter sports there are plenty of ski resorts just near the city center! Only in Turin for a day? Taste the famous bicerin drink: a mix of chocolate, coffee and cream. Yum! Mole Antonelliana/Cinema Museum for a panoramic view of Turin and a complete history of film.